← Great Story by Al Dronsfield!! “Lift Lock Plus! !”; this time in Scotland!! Just to remind the readers, 2 Shuffleboard Clubs from NS were represented in the 55+ Games held in Saint John NB. The Bluenose Shuffleboard Club in Bridgewater NS – and the Salt Water Club in Lower Sackville, NS. Jim and Ellie Crowell started Bluenose Club with 2 Courts and 2 clinics in the fall of 2017. We became incorporated in February 2018 and I brought 4 more courts home from Allen Shuffleboard in our motorhome in April 2018. We rent the local Curling Club one day a week. Three of our members are also members of Saltwater Club 1.5 hours away – namely Rose and Jim Irwin and Jack Hatt. 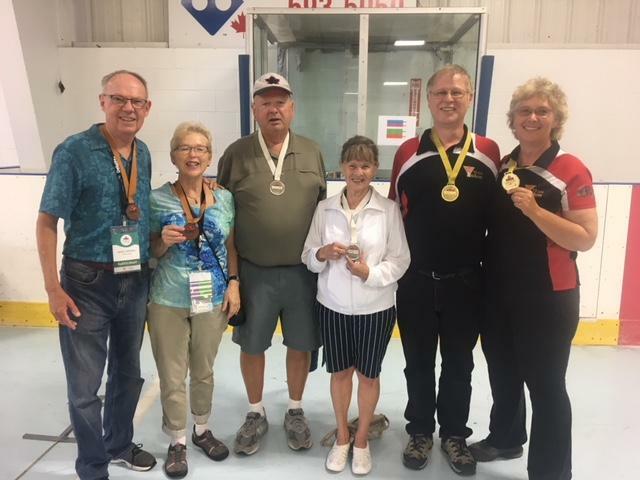 At the 🇨🇦 Canada 55 Games the team that won Gold For Yukon actually moved to Yarmouth NS last April which meant that “ Residents “ of Nova Scotia actually took Gold, Silver and Bronze in the 55 + category. It also means that of the 12 Shuffleboard medals (6 teams) that 5 of 12 were members of our Bluenose Shuffleboard Club. Very motivating. Stan, we appreciate how much you do for Shuffleboard. Bluenose Shuffleboard Club, Bridgewater NS & Zephyrhills Shuffleboard Club.